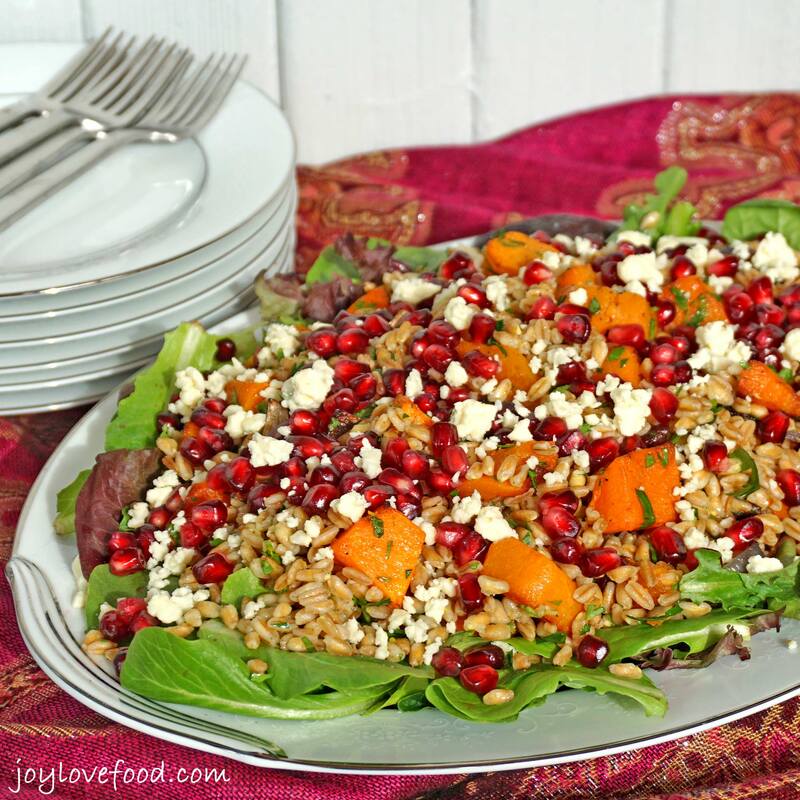 Farro Salad with Roasted Butternut Squash, Pomegranate and Gorgonzola – this colorful salad is full of flavor and so easy to prepare, perfect for a dinner party or a healthy lunch. I love farro, it is a protein-rich grain with a wonderful nutty flavor and a nice chewy texture. It is very versatile and can be used in a variety of preparations including soups and salads. A couple of weeks ago, I shared my recipe for Quinoa with Pomegranate, Pistachios and Feta, I really love the combination of pomegranate with the nutty quinoa and thought that pomegranate would also go well in a farro salad and that certainly is the case. This Farro Salad with Roasted Butternut Squash, Pomegranate and Gorgonzola has a wonderful combination of flavors, textures and colors. It is also rich in protein and fiber, Vitamins A and C and antioxidants. While the butternut squash and red onion are roasting in the oven, I prepared the farro and an orange vinaigrette. Once the farro was cooked and drained, I added it to my dressing, along with some fresh parsley and the roasted butternut squash and red onion and tossed to combine. I like to serve this salad on a bed of baby green lettuces. I mounded the lettuce on a serving platter (you can also use individual plates) and topped it with my farro and squash mixture. I then topped the salad with some pomegranate arils and gorgonzola cheese crumbles. The resulting Farro Salad with Roasted Butternut Squash, Pomegranate and Gorgonzola is so delicious and full of flavor. The farro provides a nice nutty chewiness which goes so well with the sweet and savory combination of roasted butternut squash and red onion. Pomegranate arils give the salad a nice tangy crunch and gorgonzola provides a creamy, cheesy bite; the orange vinaigrette and parsley provide brightness and freshness. This flavorful Farro Salad with Roasted Butternut Squash, Pomegranate and Gorgonzola can be served warm, at room tempature or chilled. This colorful salad would be perfect for a dinner party, it can be prepared before guests arrive and will hold up well and look beautiful on the table or buffet. This delicious salad would also be great for potluck or brunch party, it also wonderful for a healthy lunch, which is how I’ve been enjoying it this week. Do you have a favorite preparation for farro? Please let me know in the comments below! 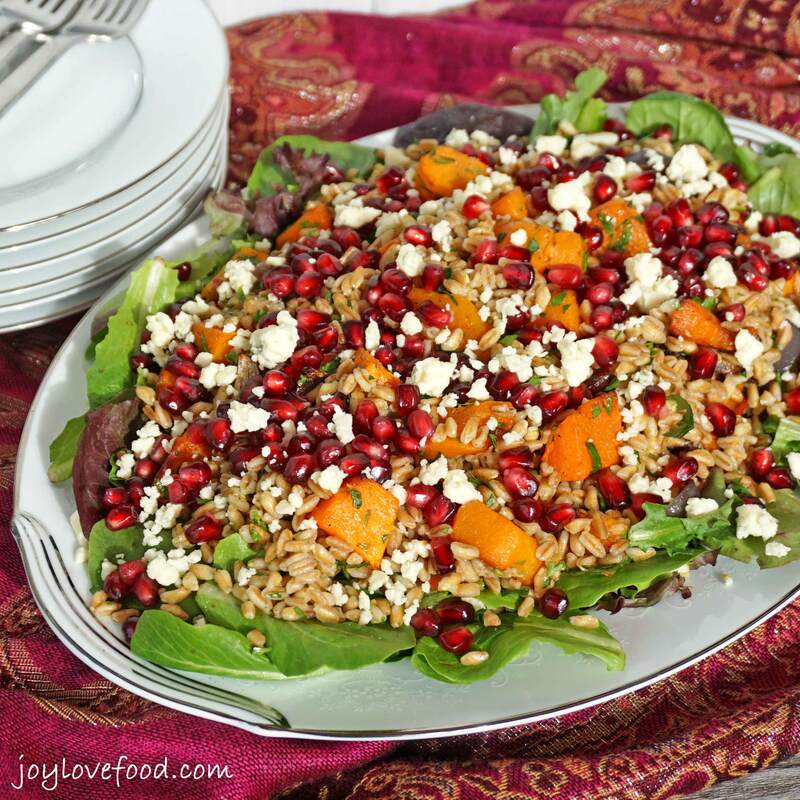 Farro Salad with Roasted Squash, Pomegranate and Gorgonzola - this colorful salad is full of flavor and so easy to prepare, perfect for a dinner party or a healthy lunch. Toss the butternut squash and red onion with 1 tablespoon olive oil on a baking sheet. Spread evenly on baking sheet and season with salt and pepper. Roast in preheated oven, stirring occasionally, until squash is tender and onion begins to caramelize, about 20-25 minutes. While the squash and onions are roasting, prepare the farro according to package directions (see notes). While farro is cooking, prepare the orange vinaigrette. Add 2 tablespoons olive oil, orange juice and zest to a large mixing and bowl and whisk to form a dressing. Once farro is cooked and drained, immediately add it to the mixing bowl and toss with dressing to combine. Add parsley and roasted squash and onions to mixing bowl and gently toss to combine. Season with additional salt and freshly ground pepper to taste. Mound mixed baby lettuces on a serving platter (or individual plates). Top lettuce with farro and squash mixture. 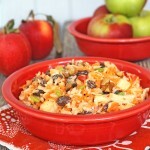 Top farro salad with pomegranate arils and gorgonzola cheese. Serve immediately, at room temperature or chilled. I used quick cook farro, purchased at Trader Joe’s, which only takes about 10 minutes to cook. There are different types of farro with different cooking times, some require presoaking, so be sure to follow the package directions. You can purchase packaged pomegranate arils at Trader Joe’s (in the refrigerated produce section) or you can remove the arils from a pomegranate (which is what I did). One pomegranate will yield about ¾ – 1 cup of pomegranate arils. 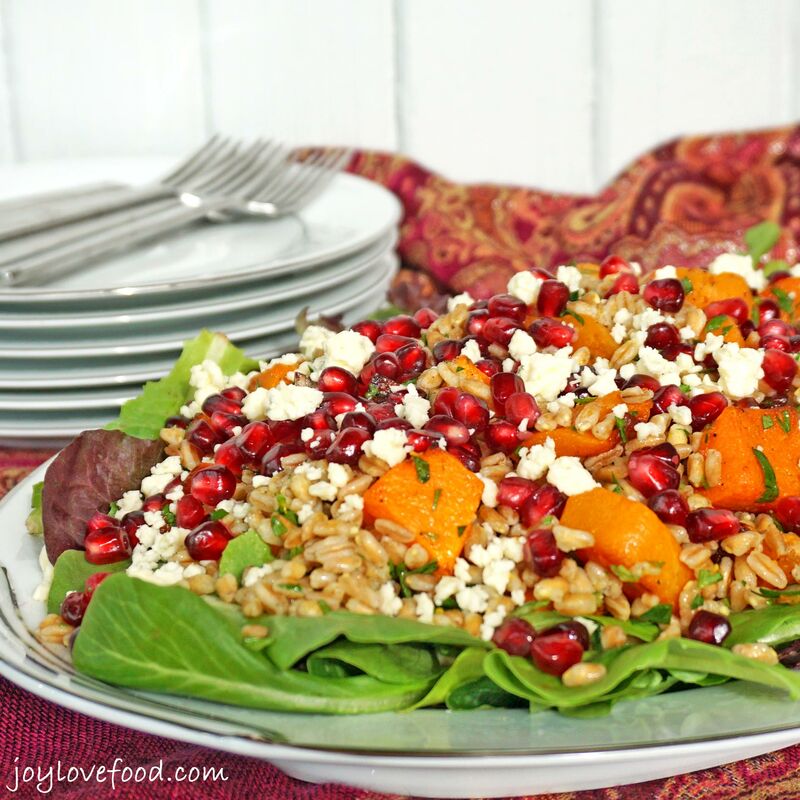 This entry was posted in Main Dishes, Salads & Sides, Vegetarian and tagged butternut squash, dinner, easy, entertaining, farro, gorgonzola, healthy, lunch, orange, party, pomegranate, quick, roasted squash, salad, vinaigrette, winter. Yum, what a tasty salad. I love the pomegranate you added in there. I bet that just adds something extra to this already yummy salad. linda spiker recently posted…Fettuccine with Tomatoes and Burrata Cheese! Oh my does this salad look and sound delicious! Pinning to share and refer back to when this lands on our dinner table soon. This looks delish! Thanks so much for sharing with us at #merrymonday! what a gorgeous looking salad, so many bright colors. This is such a beautiful salad full of a bunch of my favorite ingredients. Add a little extra protein for the Mr. . .and Voila!. . .the perfect din din for us. As for me. . .I cook quite a bit with farro. . .usually using it as a feature in salads (just like you have done here). I’ve been trying to find farro, it looks interesting! Thanks for sharing this recipe! 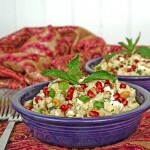 I love pomegranate seeds and they sound like they go well in this recipe. Adele recently posted…Should I give my children chores? 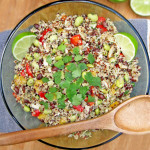 I love adding pom seeds to dishes like this too! I have yet to try farro though. I need to add it to my list of ingredients to try soon because I love the look of your salad. I have a butternut squash waiting for me to cook it up, this would be a very good recipe to use it in! I’ve honestly never heard of farro, but I love Trader Joe’s and this salad looks delicious! This is one of THE most beautiful, unique and delicious salad I’ve seen lately!! What a colorful salad and i love roasted squash! This is a perfect light meal! What a delicious looking salad! I have never cooked farro if you can believe that! Adding that to my shopping list so I can give this recipe a try! It’s so beautiful and looks delicious. I can’t wait to try it. Thanks for sharing. Thank you for your shortcuts. To be able to have a dish this gorgeous and delish in just 30 minutes is fantastic! WOW! The salad is a masterpiece! So healthy, yummy and colorful! 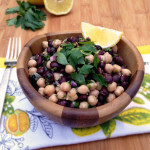 This salad is so beautiful, flavorful, and simple! I definitely will have to try this at some point! Roasted butternut squash is such a great addition! 😀 Thanks for sharing! Joy, this is a gorgeous salad. I love the nutrients and color. Pinned. What a pretty and delicious looking salad! Farro is a grain I have still to try, somehow (sadly don’t see it that much) but I must hunt some down as this looks and sounds so tasty! I have been on a pomegranate kick lately and I have to try this! I’m sitting here waiting to eat dinner and this looks so good! I have never had farro before but you make it sound so delicious. I’m going to Trader Joe’s tomorrow and I know they have it. Great recipe! Thanks Denise, I hope you give farro a try, it is really good!